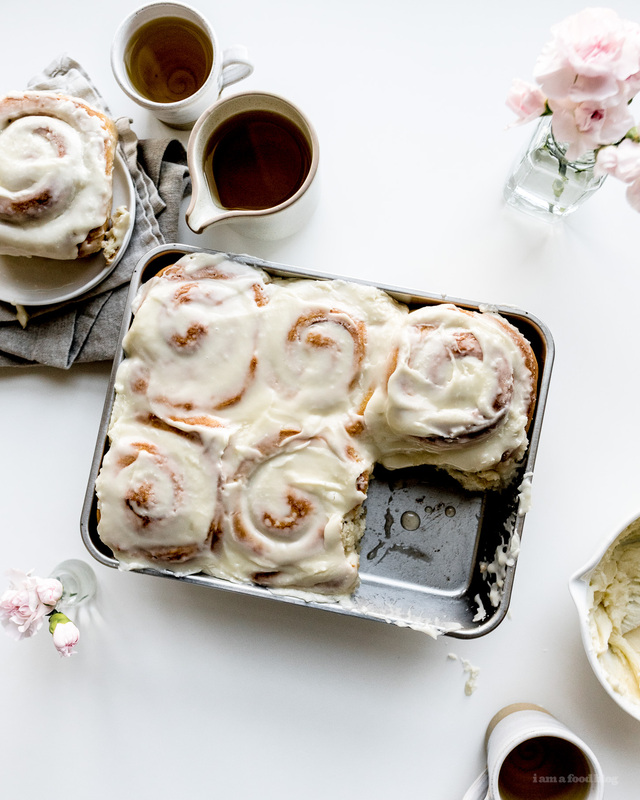 There’s something so cozy about cinnamon buns. 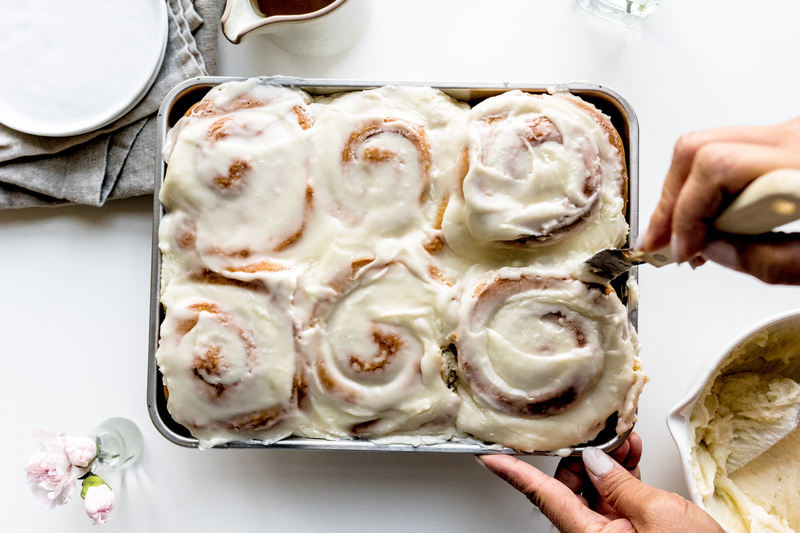 I don’t know if it’s the fact that you tuck them underneath a blanket (plastic wrap, really), waiting for them to take a little nap and rise, or if it’s because the smell of cinnamon reminds me of fall foliage, but there’s something about a warm tray of cinnamon buns that makes me feel the fall feels every time. 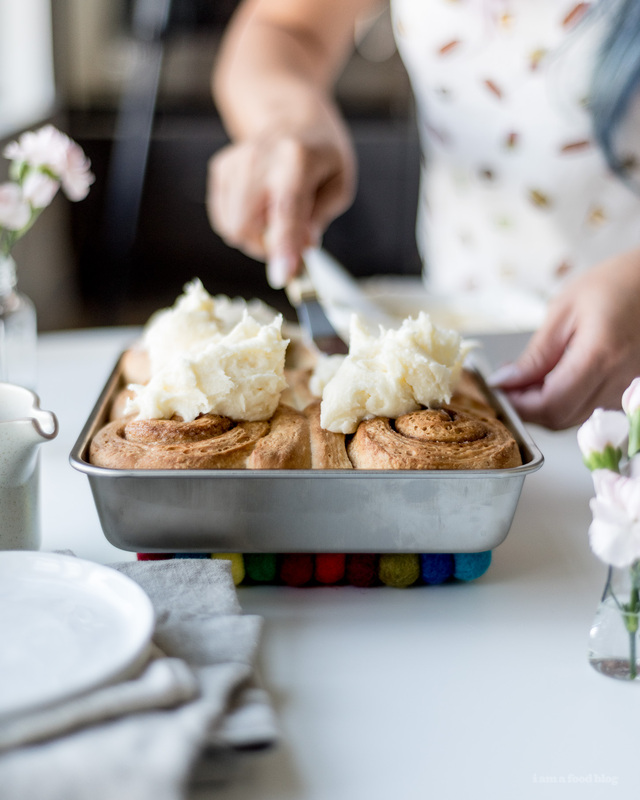 These guys might just be the easiest cinnamon buns I’ve ever made – plus they’re vegan cinnamon rolls! 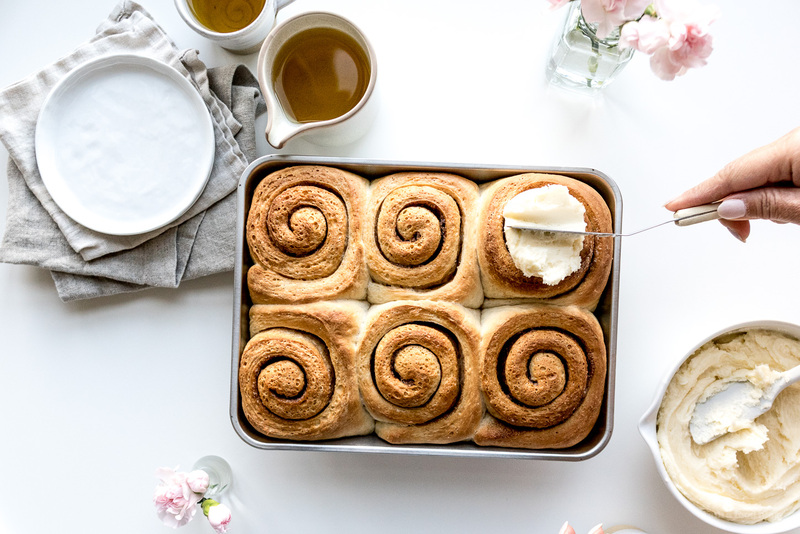 A while back, I was fooling around with making dairy-free buns and discovered that hey, cinnamon buns made with coconut milk and oil are maybe even better than cinnamon buns made with milk and butter. Mike certainly thought so because these cinnamon buns (minus the cream cheese icing) are his fave. I know, I know, I ruined the vegan, dairy-freeness of these buns by slathering them with cream cheese frosting, but I had some leftover in the fridge and couldn’t resist. If you need to go the dairy-free route though, you can easily whip up a coconut milk glaze that is so good you could drink it. These guys are perfect for me because while I don’t always have milk on hand, there’s always a can of coconut milk and coconut oil in the pantry, so whenever the cinnamon bun craving hits, I can fix it. And they only need 6 ingredients! Well, 7 if you want to glaze them. I especially like making a batch late at night, rolling them out, and then having them ready to bake in the morning. Hope you guys give these a go! 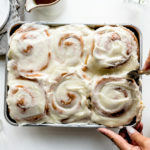 Let me know how they compare to your regular cinnamon bun recipe, I want to know! Sprinkle the yeast over the coconut milk. Stir and let proof. Whisk in the coconut oil. In a large bowl, whisk together the flour and sugar. Pour in the coconut yeast mixture, stir and then knead by hand until the dough comes together into a ball. Let rise in a warm spot, in a clean bowl, covered loosely with plastic wrap, until doubled, about 1 hour. 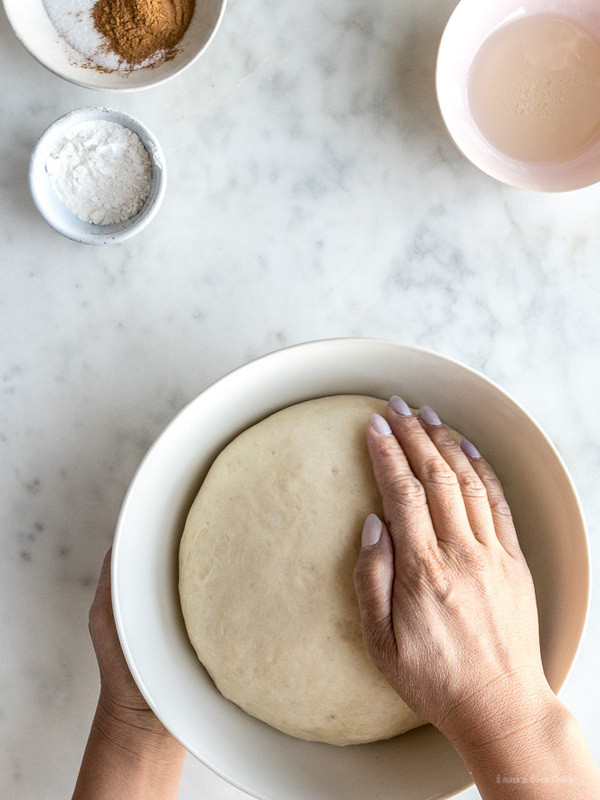 On a lightly floured surface, tip out the dough and roll out to a large rectangle, about 14 x 20 inches. Brush the coconut oil on evenly, all the way to the edges. 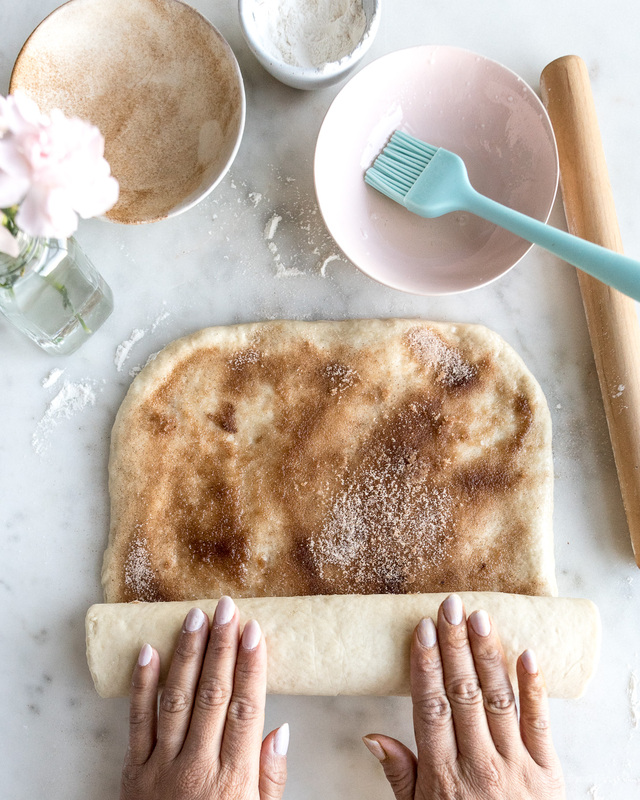 Whisk together the cinnamon and sugar in small bowl then spread evenly onto the dough. 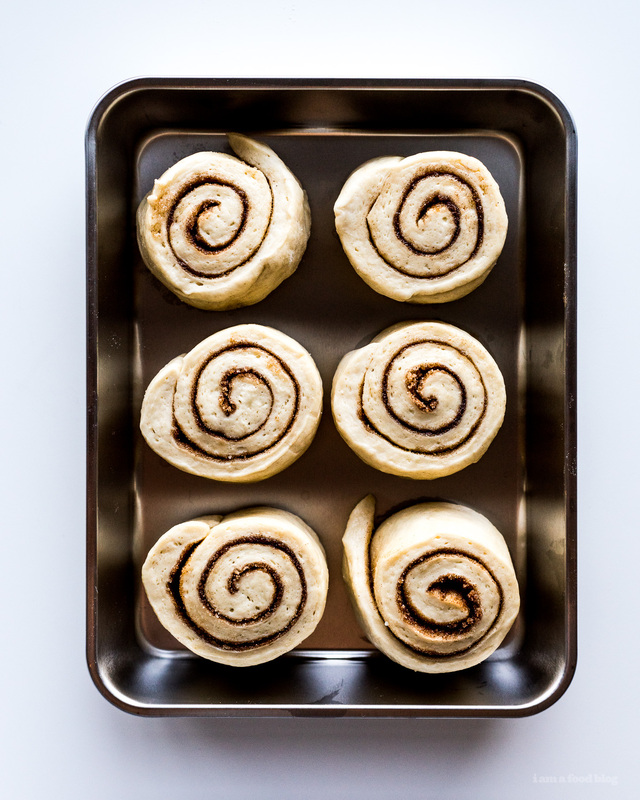 Roll into a tight roll, and depending on what side you want your cinnamon buns, cut into 6 or 12 equal pieces. Place the rolls into the pan, cover loosely with plastic and let rise for 1 hour, or until doubled. 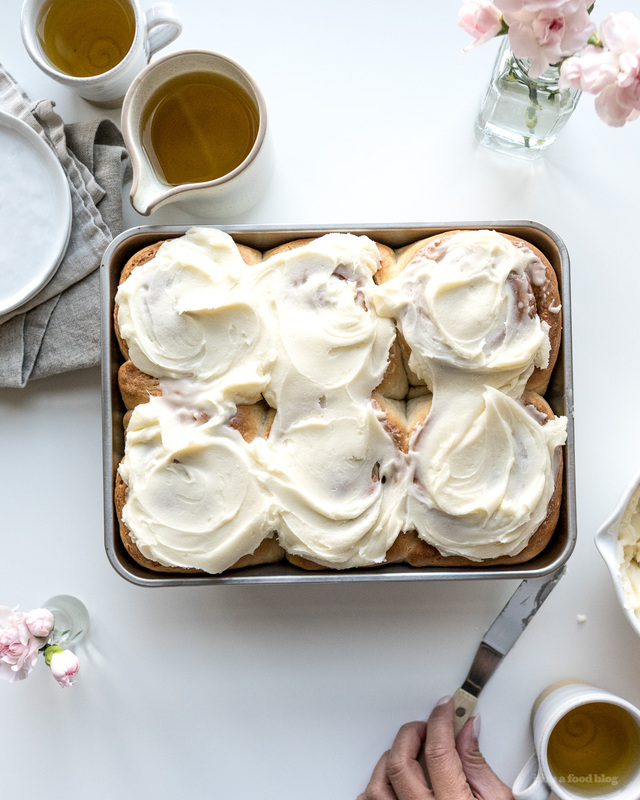 At this point, you can hold the buns in the fridge if needed – if you’d like to prepare them the night before and bake them off in the morning that definitely works. Preheat the oven to 350°F. Remove the plastic wrap and bake the buns for 25-30 minutes for small buns, 30-40 minutes for big buns, or until golden and cooked through. If baking from the fridge, remove the buns from the fridge as the oven is heating up. 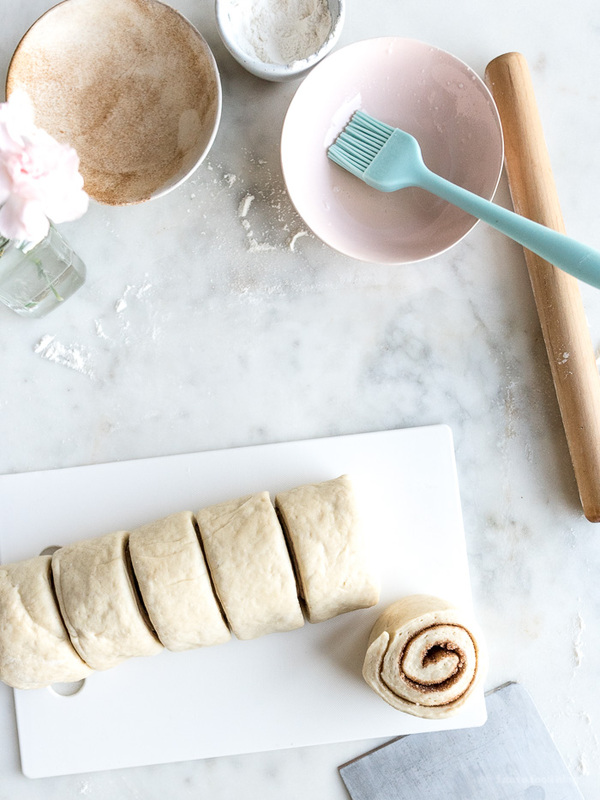 Bake for 30-35 minutes for smaller buns and 35-45 minutes for big buns. Optional: while the buns are baking, make the glaze. Stir together the coconut milk and sugar until smooth. When the buns are done, the tops should be golden brown and a skewer poked through should come out clean. Glaze immediately, if doing so. Let cool slightly and enjoy warm! Wow, these look absolutely amazing! I may be making these for Sunday morning breakfast tomorrow, especially because they only require 6 ingredients. Thanks so much for sharing! Also your photos are really great as well. hope you got a chance to try these stefanee!! Seriously? Coconut milk in cinnamon buns? Why have I not thought of this… Sounds heavenly with the cinnamon…Mm mm. These are going on the “to make” list. give the coconut oil/milk a try, it’s really nice! They look so lovely! Was wondering if you used the thick kind of coconut milk, or the thinner one that’s like regular dairy? the thick kind that’s out of a can! Hi Stephanie, amazing post as always. What kind of flour did you use ? plain or self raising ? Many thanks. Do you shake the heck out of the canned coconut milk to get it to all be cohesive or do you drain the liquid just use the thick part? I never know what to do! shake it up in the can! or what i tend to do is open it up and use a pair of chopsticks or a fork to whisk everything together. I left the can in the warmest room in the house – the room with the wood stove – for an hour beforehand, which helped like woah with the fat issue. Does the coconut taste come through strongly or is it mild taste? it’s pretty mild, you won’t really notice it! hi there! these look awesome! what kind of coconut milk do you suggest using for this? Do you think subbing cashew milk would work or not enough fat in it? Im so glad you posted a vegan option, so hard to find these days. All Ive been seeing is recipes for avocado toast. So glad these cinnamon buns don’t have meat or dairy. I tried them, they were okay. Third times the charm though, so i suppose I have to make them two more times, ill update you when Ive completed this task. Could be months, I don’t bake often. These look delicious and perfect for Christmas morning! My question is do you prove the rolls for a second time before refrigerating them overnight or just put them in the fridge to prove slowly overnight OR prove them for the second hour in the morning as they go back down to room temp? you prove them just once before refrigerating (they should double after an hour), then pop them into the fridge where they’ll slowly proof a bit more. the next day, while the oven is heating, let them sit on your countertop to come to room temp then bake. hope that helps! Made this two nights ago – amazing recipe! My cinnamon buns have never turned out this good and this recipe was so simple and low stress. This will be my go-to in the future~ I ended up making a coconut cream cheese glaze with 4oz cream cheese, 1/4 cup coconut milk and about a cup of confectioner’s sugar. Yay cream cheese!! Cant wait to try this recipe, looks and sounds delish! How many calories, sugar, fat etc. are in these? I made these for my (vegan) father for Christmas and they were delicious!